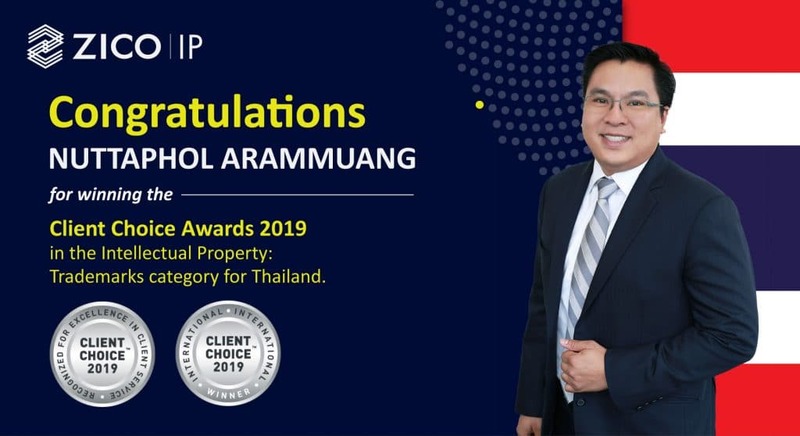 Congratulations to ZICO IP’s Thailand partner, Nuttaphol Arammuang, for winning the Client Choice Award 2019 in the Intellectual Property – Trademarks category for Thailand. This award signifies a remarkable three consecutive years of Client Choice Award wins for Nuttaphol, who earned the award in 2018 and 2017 for patents and trademarks, respectively. It is a symbol of his passion for delivering innovative solutions to his clients, and making sure they have a pleasant experience working with the firm. Client Choice was established in 2005 to recognise law firms and partners around the world that stand apart for the excellent client care they provide and the quality of service they receive. The award winners are selected through a meticulous nomination process via feedback and surveys to In-House counsel around the world. The celebratory award winners’ dinner was held in London on 7 February 2019. For more information regarding the award and the winners, please visit //www.clientchoice.com.